Each man discovers and cherishes the Diva of his life. Passionate, he offers her a unique sublime jewelry watch covered with diamonds. A true sculpture with lines both audacious and subtle, the DELANCE “Diva” watch was created for a woman who enjoys her femininity with enticing flair. The 101 white diamonds for a small watch or 141 for a medium one show the luminosity and the elegancy of this model. 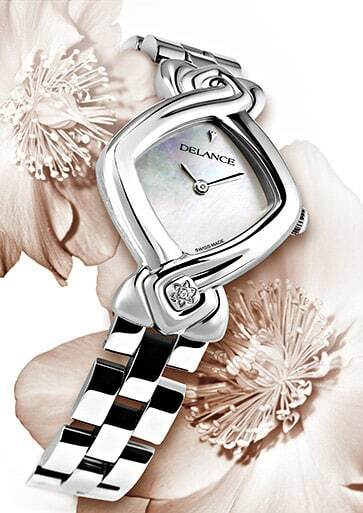 A DELANCE jewelery watch for a woman who crunches life to the fullest. “Gaïa” , in Greek means “Mother Earth“, is a DELANCE “Gaïa” watch dedicated to the Earth. The number of stones, 72, represents the Earth number as well as the number of languages that merged around the Babel tower. In the Feng Shui philosophy, yellow is the colour of centre and that of the Earth. “Diamonds are a girl’s best friend” With a complete inlay of small diamonds on the case, the DELANCE “Diva” is a gift fit for royalty. This masterpiece tells the woman enamored with the brilliance of the diamonds, that she deserves all the pleasures of life. A veritable sculpture, Delance “Infinity” watch, inspired by the number eight, this pendant is marvelously delicate and refined.